The Board of Trustees of the J. Paul Getty Trust announced today that James Cuno, recognized both nationally and internationally as a noted museum leader and scholar and an accomplished leader in the field of the visual arts, has been named president and CEO of the J. Paul Getty Trust. 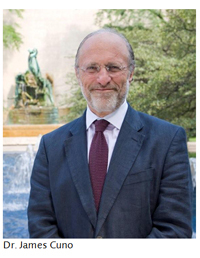 Dr. Cuno, who comes to the Getty after serving as president and Eloise W. Martin Director of the Art Institute of Chicago since 2004, will assume his position August 1. Cuno's position on cultural property is well-known (see some of the reviews of his work).